It is ironic that of the millions of visitors who flock to the grave of Mumtaz Mahal in Agra, few spare time to pay respects to her grand father-in-law, the third and greatest emperor of the Mughal empire in India: Jalaludin Mohammed Akbar (The Great). 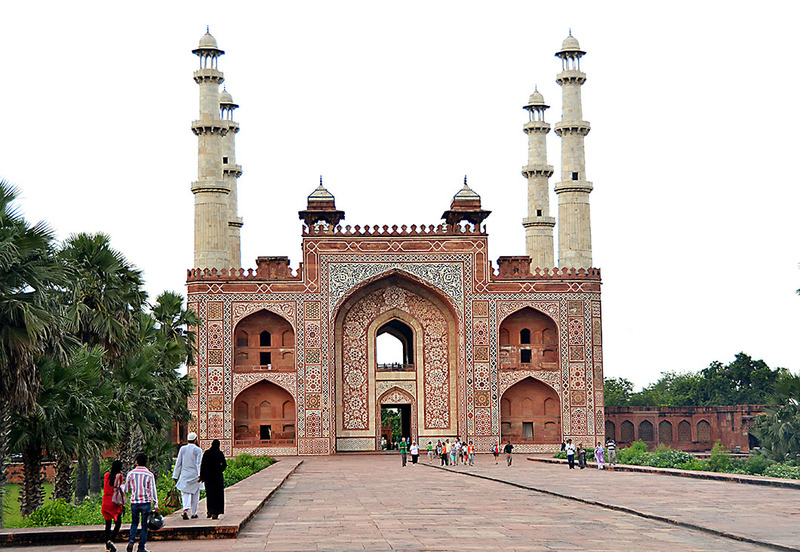 The magnificent red sandstone South gate with marble minarets that outshines the monument itself! Akbar’s story is as remarkable as the man. Born in 1542 of Shia and Sunni parents in exile, in the home of the (Hindu) Rajput Rana of Umarkot, and bred in his paternal ancestral home in Kabul (while his father Humayun wrested the empire back from Pathan invader Sher Shah Suri in Delhi), he ascended the throne at thirteen under the guidance of his father’s skilled and trusted general Bairam Khan, put down an afghan revolt at seventeen, and took control of the empire from his able but cruel guardian by eighteen. He moved his capital to Agra and went on to extend and consolidate one of the most powerful empires of the subcontinent. His early campaigns, possibly still under the influence of Bairam Khan’s vengeful legacy, were marked by brutality. The bloody siege of Chitor in particular and the massacre of thousands of civilians that followed, remains a blotch on his illustrious military accomplishments. But he remarkably managed to evolve into a secular king, nearly two centuries before the term ‘secularism’ came into existence. His attempts to reconcile religious differences were daring for the time. He promoted fair trials, allowed the forcibly converted to reconvert, abolished the existing oppressive ‘pilgrim tax’ on non muslims, and elevated them – and his Hindu in-laws – to equal status in his court. His Rajput queen (princess of Amber) is said to have been the love of his life and had considerable influence on his religious outlook. He built a hall of worship in his palace, Fatehpur Sikhri, where he met with representatives from all faiths without prejudice. He had the Bible translated to Persian. He ordered his son Murad to study the New Testament. He invited Jesuit priests to set up a church in Agra and is even said to have attended a Christian wedding where he translated wedding vows to the bride! “……as the result of all the influences which were brought to bear on his Majesty, there grew gradually, as the outline on a stone, the conviction on his heart that there were sensible men in all religions, and abstemious thinkers and men endowed with miraculous powers among all nations. If some true knowledge were thus everywhere to be found, why should truth be confined to one religion, or to a creed like Islam, which was comparatively new, and scarcely a thousand years old; why should one sect assert what another denies, and why should one claim a preference without having superiority conferred upon itself?” ~ Mullah Abdul Qadar Badauni an Indo-Persian historian and critic of Akbar’s religious policies. So he proceded to set up a new ‘divine faith’ named Din e Ilahi, that drew upon good elements from all religions. He dispensed with the clergy and cleverly appointed himself chief ‘interpreter’ of God’s will. While Muslim theologians weren’t pleased, his subjects were. With the notion of equality at least, even if no one rushed to embrace the new and radical order. The five storied, pyramidal tomb structure. The illiterate, dyslexic, astute statesman was buried in 1605 in a mausoleum in Sikandra (a suburb of Agra) that he designed himself and that seems as eclectic as his religious beliefs. It is set in a quadrilateral ‘char-bagh‘ garden that is home to herds of Indian antelope. But it isn’t very clear whether his mortal remains are still in there. Akbar’s legacy of harmonious co-existence was frittered away by increasingly hawkish descendants. The demolition of temples in Mathura – the birth place of Krishna – by his dogmatic great grandson Aurangazeb, incurred a fierce three decade long Jat uprising, in the course of which, and in retaliation for the horrific execution of a rebel leader, the mausoleum was desecrated. It is believed that the remains of this most secular king of them all were dug up and thrown into a bonfire. A profusion of white marble and black slate inlay! The tomb structure is an eclectic mixture of styles. Note the Indian inspired pavilions and the absence of a central dome. Thanks for all your posts, inputs, beautiful pix and generally for enhancing my knowledge, Madhu. Reading today’s post also ram parallel to the beautiful besieged Palmyra. Hope these artifacts, these heirlooms History has bequeathed to us, will never meet that fate. I know expecting madmen to value world heritage is naive, but I do hope good sense will prevail. Happy to see you here Ashu. Thank you for reading. I love the historical aspect of your post, it was very fun and interesting to read. To have accomplished and been through so much at such a minor age seems something out of legend, blemishes on his career or not. Great read, thank you! I think so too. Although I doubt the descendants of those massacred will agree! It is all relative, but on balance he was one of our best kings. Thank you for reading through and taking the time to comment. Much appreciated. I can understand why Akbar’s forward thinking views on religion were threatening to many. He seemed to understand a bigger picture perhaps. I enjoyed reading about him and touring the remains of his Mausoleum. There always seems to be such beauty left amongst the chaos! India has the most incredible rich culture and history Madhu and you are brilliant at sharing it. So is the princess the same one as in Jaipur? Yes Gilly. That was a marriage of convenience that is even today fodder for many romantic novels and Bollywood flicks 🙂 The Jaipur kings allied with the Mughals. The Ranas of Mewar – Chitor, Udaipur and Jodhpur – held out fiercely till the very end. Thank you very much Sue. Glad you found it interesting. What a magnificent structure Madhu. Isn’t it? That gate is particularly impressive. I agree and worth the visit. I have been there. .and as you have decribed it is a beautiful place..
‘Our’ religion Bikramjit! And does it really matter? Religion just lends or appears to lend a notion of legitimacy to these crimes. Today as then the real underlying reasons are entirely unrelated. Yeah sorry OUR. . The reason I said that their is .. I am not very religious..
Who knows, then, where everything arose? Who can say how creation happened? The gods themselves came after Creation. He alone knows. Or maybe He too does not. Brilliant! Thank you for that enlightening verse Aruna. I do so love your posts. The one thing that struck me when I read the Mughal history was that the Mughal emperors were basically nomadic warriors who spent their entire life capturing kingdoms and then either dying within a few years or then losing the kingdoms. The futility of war and conquest is never more evident than in history. Absolutely. Although Akbar lived to the grand old age of 63 (a decent age for the time!). His security detail must have been efficient considering the number of people he displeased 😀 Thank you very much for taking the time to comment Aruna. Much appreciated. Beautiful and somewhere I have not had the pleasure of seeing in my lifetime. I really enjoyed visiting old Mogul building creations. That certainly was a golden era for architecture. Yes Ian, a golden era that culminated in the Taj Mahal. I think it has been downhill ever since. Good post! I had no idea about the history though! Madhu, as always I love your posts, which give me inspirations for my trip to India next year. Thank you Cornelia. I hope you are allowing yourself more time in Agra. At least one night. Two if possible. If only his attitude to religion was replicated everywhere, imagine the history of the world into the present! Seems like a no-brainer doesn’t it? Can’t quite figure out why it isn’t apparent to everyone. Thank you Meg. Thank you for this fascinating slice of the complex history of India. I didn’t get to his Mausoleum, but did visit Fatehpur Sikhri which is extraordinary. Most welcome Alison. There is so much to do in Agra. Itimad ud Daulah’s tomb is exquisite. Mariam – Akbar’s Hindu wife – is also buried nearby, and the Anglican cemetery is supposed to be very interesting. They all lose out to the glory of the Taj Mahal sadly. Didn’t even know it existed! though have visited Agra a couple of times. And the historical background is another eye opener! A worth-reading post indeed. I am very impressed by your use of (less controversial) ‘Rajput Princess’ instead of naming Jodha as his queen. Good job. A very interesting read, Although many in Pakistan consider Aurangzeb as one of the greatest, I can see why Akbar is regarded highly in India. Jokes apart, historians do consider him the most able and astute of all Mughal rulers. But his cruelty towards his subjects as well as his father and siblings cannot be brushed aside. He was after all the one who presented his older brother’s head to his ailing father on a platter!! That surely falls short of greatness, whichever side of the fence one sits on. It is also believed by many, that had Darah Shikoh rightfuly inherited the kingdom, the history of the subcontinent might have taken a turn for the better. Before colonial intervention at least. But that might be an Indian perception as well 🙂 Happy to see you here Ibrahim. I hope I get to visit some of the Mughal sites in Pakistan someday. Inshallah! Yeah, they were basically cruel warriors who didn’t care for anything except their lust for absolute power. What I meant was the general perception of the people. Fatehpur Sikhri was on our tour but not the Mausoleum. You have filled in some historical gaps and insight, Madhu. Glad the historical background made sense Lynne. It would be impossible to fit everything into an India itinerary. We found the custodians at Fatehpur Sikhri very aggressive. Their hassle diminished our enjoyment somewhat. I am so grateful both for the beautiful pictures and the wonderful history you always provide. This one was especially enlightening. What a terrible waste of a wonderful legacy. We could stil go back and learn from that legacy, but we stubbornly resist. Always grateful for your company Valentine. Thank you. And glad you enjoyed the history Kat. You are absolutely right, Madhu – text books tend to gloss the facts, that’s anice way of putting it. Thanks for putting it right and opening our eyes! 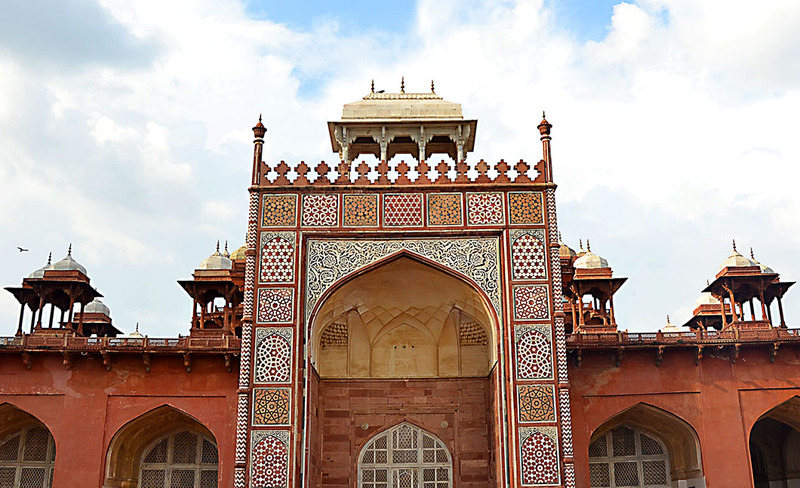 I enjoyed reading about Akbar and touring the remains of his Mausoleum with you. Great photos. History has significant role to play in our life and it shapes our future, but we keep forgetting our history and we get lost in the glitz and glamour of the present. History matters and we keep realizing it’s value when we start visiting places with such historical importance and that questions our ancestors ability and vision to create wonders. As usual a very insightful and informative post. Thanks Nihar. History’s lessons are forgotten more often than not, by those who most need to remember them. What an intriguing history lesson – thank you for sharing, Madhu. Sad it is that some of us are almost certainly never exposed to such rich and formative history. I have been to Agra a number of times but I have visited this one. Thanks for retelling the history around Akbar again. Beautiful post madhu… We couldn’t visit sikandra due to time constraints…I so wanted to…and now after reading your post …i so want to go back. It truly is amazing… It just leaves you speechless …. The architecture and the history is mind blowing. Madhu, reading this post makes me wonder why Bama and I didn’t leave any time on our month in India for Agra! All those exquisite marble and slate inlays, the pavilions and soaring minarets… and of course Fatehpur Sikri and the Taj are nearby! A fabulous narration; can’t say I knew anything about Akbar the Great before this. If only other monarchs the world over had been more open and tolerant! I’ve gone to mausoleums twice now while on vacation. It’s kind of an odd thing to do when you’re visiting a place, but I feel like it gives you a glimpse into the people and culture of the place. Akbar was the best administrator of his time. Very interesting reading about the emperor known for his religious tolerance, expansion of empire, his patronage of arts, etc. Fascinating and magical! Akbar has always been someone who has fascinated me. What a guy!